Actor Alan Alda wrote an editorial in Science last week launching a science communication contest to be judged by 11-year olds. 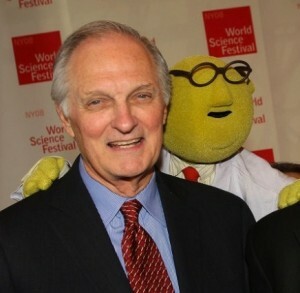 He challenged scientists to write an explanation of what a flame is “that an 11-year-old would find intelligible, maybe even fun.” Alda is also a founding board member of the Center for Communicating Science. Icelandic pop singer Bjork gave a series of shows at the New York Hall of Science this February in support of her latest album, called Biophilia. She also helped develop a series of classes for middle school students on scientific concepts mentioned in the album, like crystalline structures, lunar phases, and viruses. Last summer, rapper Will.i.am from the Black Eyes Peas used his own money to co-produce a back-to-school TV special called “I.am FIRST — Science is Rock and Roll” promoting education, science and technology. In the process, he successfully goaded singer Rihanna into tweeting “science is dope” to her more than seven million followers. Alan, Bjork, and Will.i.am: thank you for joining our cause, sharing your hope for America, and spreading the good word about science to a wider audience than most of us could ever hope to reach alone. Of course, the bulk of our task to restore science to its rightful place in American society remains ahead of us. But I wonder if the good work done by these stars signals the beginning of a deep change in our culture. Is science starting to become cool again? Interior design meets Natural History! But on the other hand, signs of a cultural shift toward interest in science might be appearing all around us. For example, you may have noticed that Natural History has infiltrated home decorating. Last year, a shop called “Curiosity… Intriguing Objects for the Home” opened in my neighborhood in downtown Baltimore. The store sells antique star maps, pieces of coral, and brass magnifying glasses—the accoutrements of a fin de siècle science museum. Across the street from Curiosity, Shofer’s furniture store is displaying glass Bell jars and large Audubon-Society-style prints of jellyfish and sharks. Maybe science really is becoming cool again, or maybe the trends above are just fads. But I’ve started to think that the recent celebrity interest in science is partly our own doing. Maybe celebrities tend to sympathize with struggling groups that show a kind of helplessness, like AIDS victims, endangered animals, and abandoned children. And maybe scientists have been seeking that kind of sympathy, consciously or unconsciously. Furniture store selling Audobon-Society-style prints. Let’s take another look at how Nina Fedoroff spoke to the press in her new role as AAAS president. Federoff has a lot to be proud of, and you might expect her tone to reflect that. She founded and directed the organization now known as the Huck Institutes of the Life Sciences at Penn State University. She has received the John P. McGovern Science and Society Medal from Sigma Xi and the National Medal of Science. But she said, “I am profoundly depressed,” and “there seems little we can do about it”; this is not the usual bearing of a scientific leader or hero. To borrow a bit of marketing terminology, I would describe the archetype of her brand as the needy orphan. She’s purposefully sending the world a message of helplessness. Federoff joins a chorus of scientific voices begging for aid. A report from the Union of Concerned Scientists came out this February called, Heads They Win, Tails We Lose: How Corporations Corrupt Science at the Public’s Expense. And you’ve probably heard of the 2010 report from the National Academies Press called Rising Above the Gathering Storm, Revisited: Rapidly Approaching Category 5. The titles of these reports imply that scientists are victims of a tempest, fighting a losing battle. Fortunately, there are celebrity philanthropists ready to be heroes to our victim. Branding scientists as orphans, as a kind of endangered species; that’s probably not a marketing strategy I would have suggested we employ. But at the moment, in Hollywood, it seems to be working.